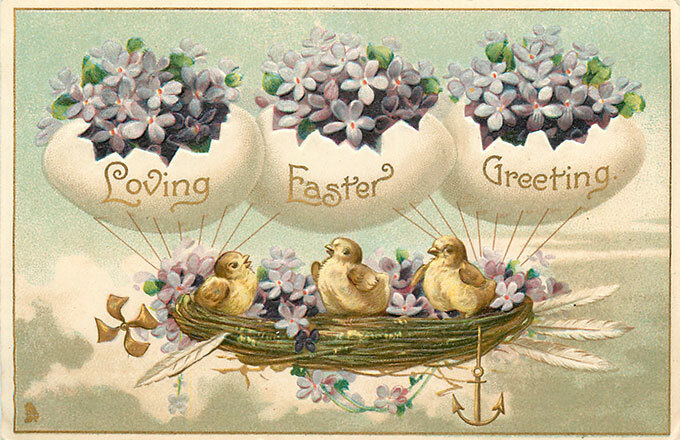 My favorite way to decorate for the various holidays is printing off some vintage postcard images and sprinkling them throughout my home. 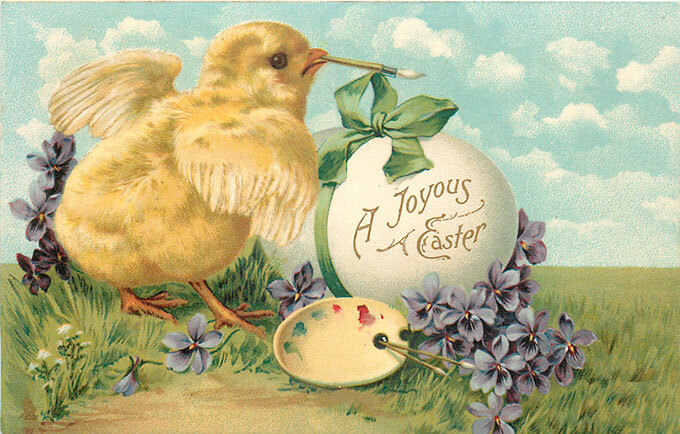 It’s a simple, quick and easy way to get a lot of color and vintage Easter goodness without a lot of work. You can just tuck them different places here and there. I found this little clipboard frame at Michael’s in bright springy colors and clipped a postcard to it. 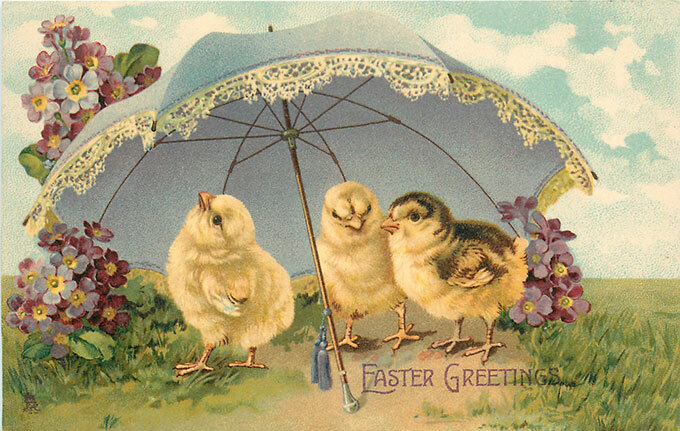 The chick under glass is a Lefton chick I used in my vintage farmhouse spring centerpiece a few years ago. That chick sure does get around! 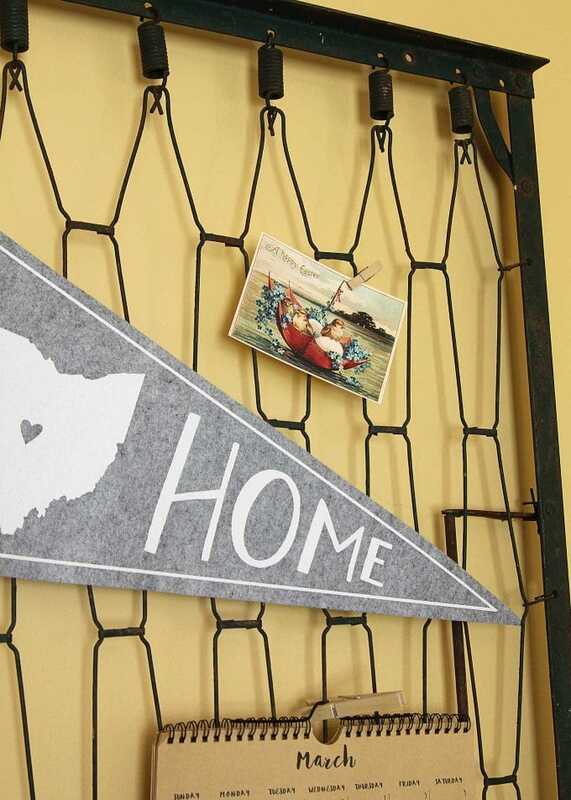 I made this super-duper simple postcard display “frame” in about 4 minutes. 24 if you count the time it took me to find and plug in the miter saw. I won’t bore you with a full-blown tutorial on it, but I took a piece of 1x8x6 pine board that I bought at Home Depot (in reality the board is 7 1/4″ wide due to silly Carpenter math) and cut it down to 21″ long. Then I stuck three bulldog clips on it with thumbtacks and clipped the postcards on it. Sure, you could paint the wood with milk paint or stain it or get all fancy schmancy with it. But I sort of like the raw, rustic look of the wood mixed with the industrial look of the bulldog clips. And there was the whole 4 minutes thing. 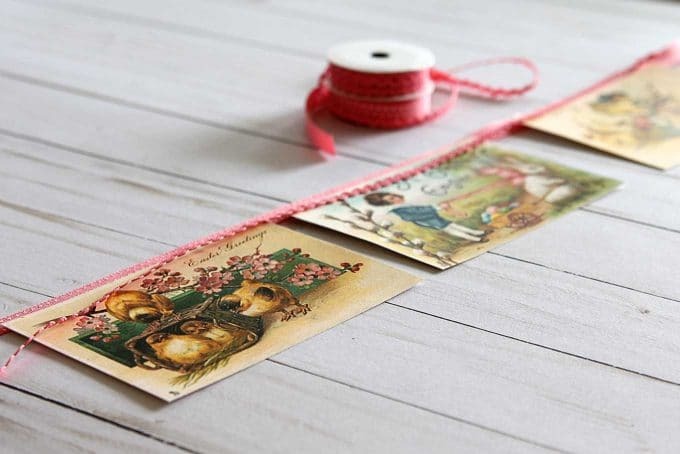 You could also make a banner with the postcard images by simply hot gluing them to ribbon. Maybe adding a few pompoms or something to cute it up a bit. And I’m saying you “could”, because I didn’t. My hot glue gun ran out of glue while I was trying to make it, so I thought a photo of me mid-way through the project was close enough. 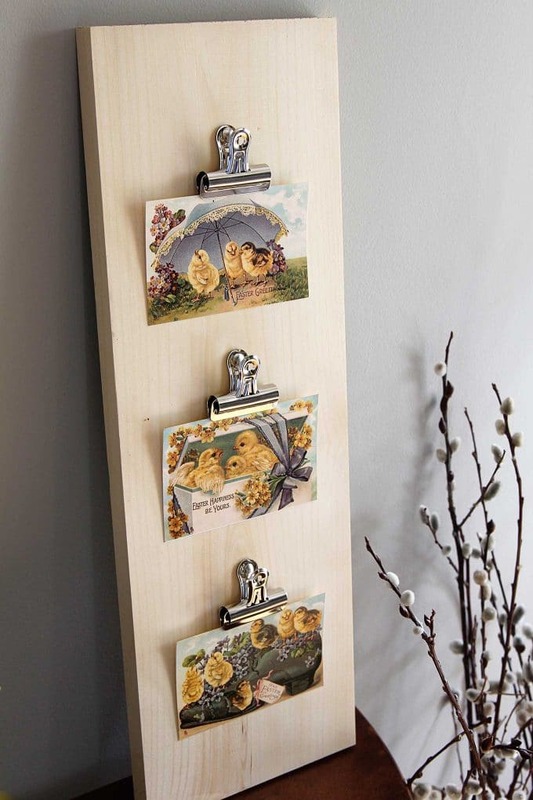 Or really, like I said in the beginning, my favorite way to display vintage postcards is the simple, just place them around the house method. Here is one simply plopped in a planter of tulips. And here is one clothespinned to my bedspring memo board. 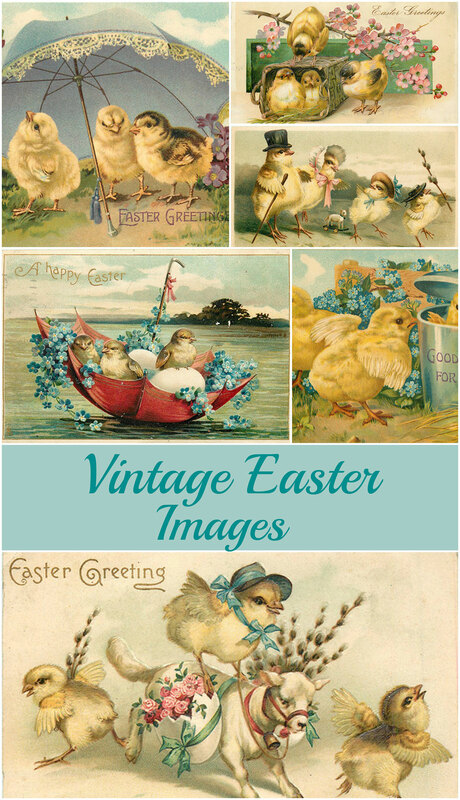 If you’d like to print out your own images to use in craft projects, here are 12 vintage Easter images for you. Since postcards easily fit 4 to a page, I’ve broken them down 4 to a page (crazy how that works). You’ll see larger versions of the images followed by the link to print those 4 images out. 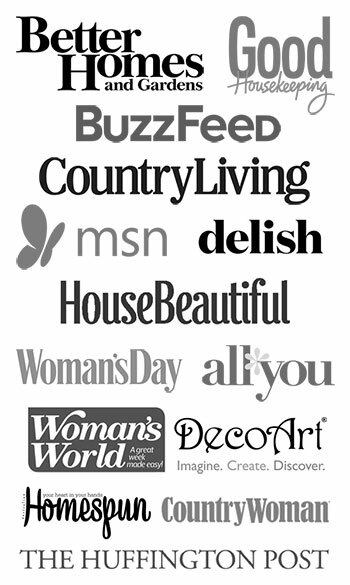 Just click where it says “Download Printable PDF file here” to download that group of images and off you go. 4th Of July Vintage Postcard Printables – because 4th of July is prime time to send postcards? It’s funny you mention fuzzy chicks! I had thought about gluing some fuzzy bits (like fuzzy glitter?) on some of them but couldn’t find it in Hobby Lobby. And honestly the sales lady was looking at me oddly when I was trying to explain I needed fuzzy stuff you can pet. These are great. Thanks for sharing them! These are so precious! 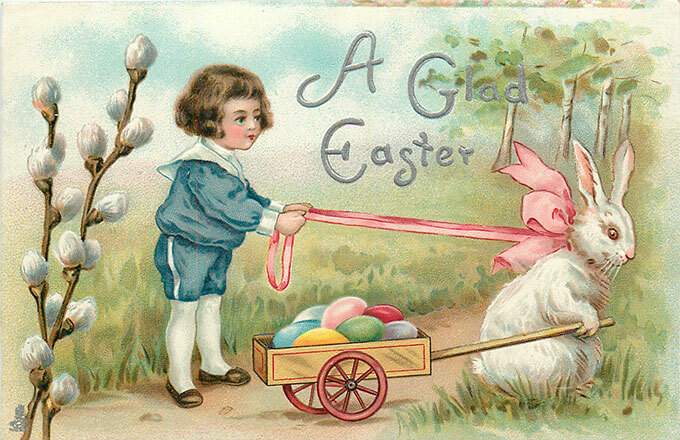 I love the one with the pink ribboned bunny tied to the cart full of eggs. Thanks so much for sharing! Gorgeous images, Pam! I downloaded them all for future projects. Thanks so much! My Monday morning read with my coffee. Your blog ALWAYS makes me happy! Happy Spring Pam. Miss Pam, AGAIN, such cute ideas for us! I love your house, your displays, your creativity! 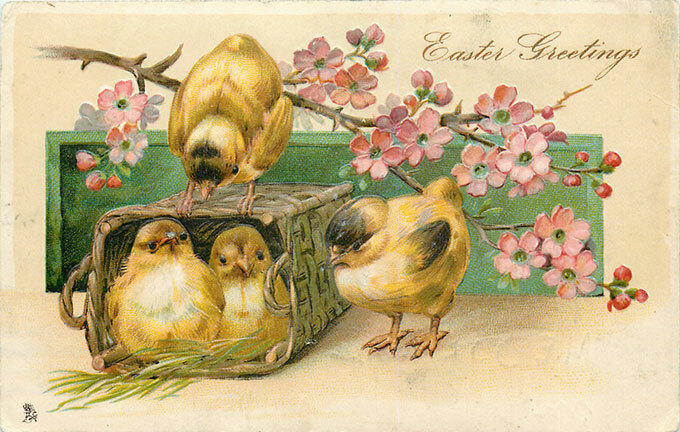 I was just thinking about pulling out my Easter boxes. Am really motivated now! THANK YOU! Wonderful images, Pam! 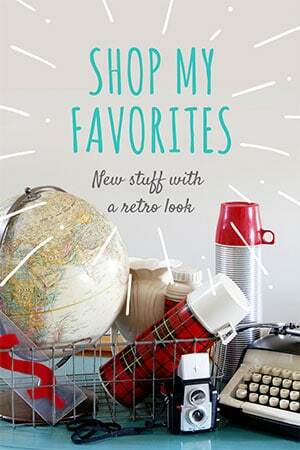 And I love your display project, too…thanks for sharing! 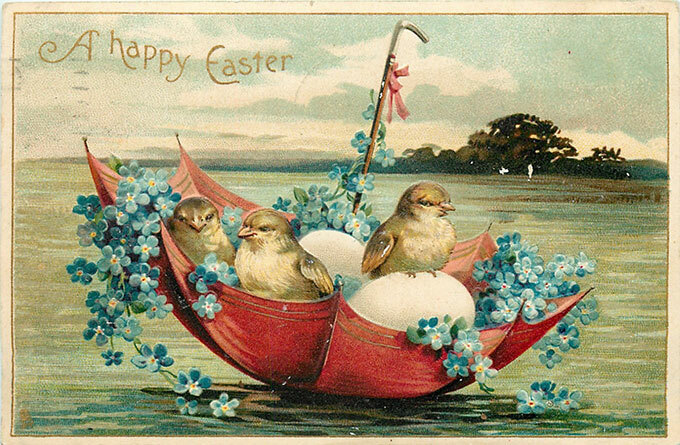 You & I are on the same wavelength with using vintage postcards. I LOVE them & you’ve reminded me to go look through my stash. 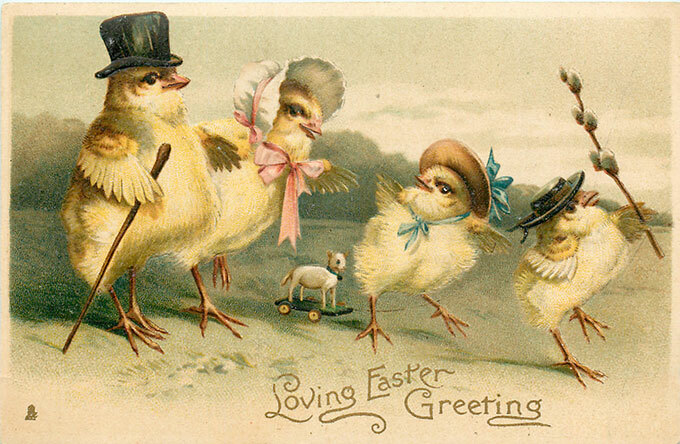 Those little chickies are so adorable & I also like your wood display with the bulldog clips. In fact, I like that whole vignette on the table. 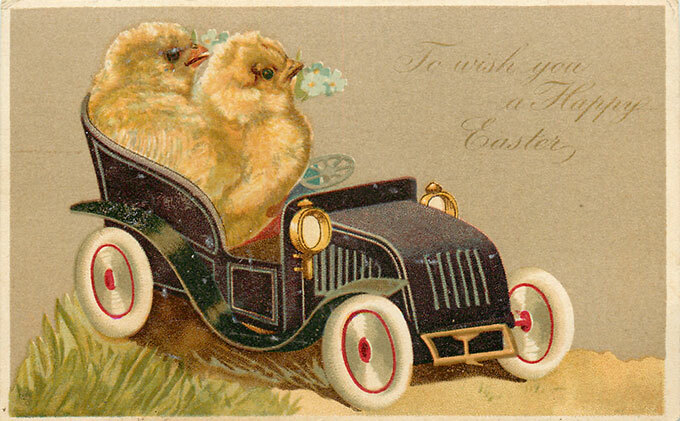 I’m getting inspiration for sure when I do my own Easter display! 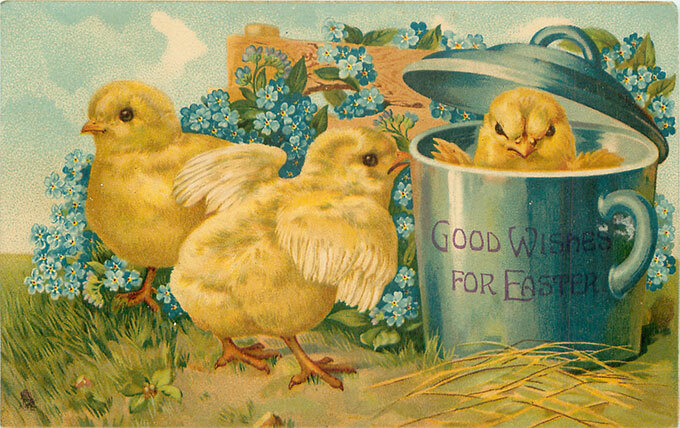 These vintage Easter images are wonderful? Thanks for posting them. LOVE the postcards. GROUP 3 with that red upside down umbrella is my favorite. Your displays are charming. 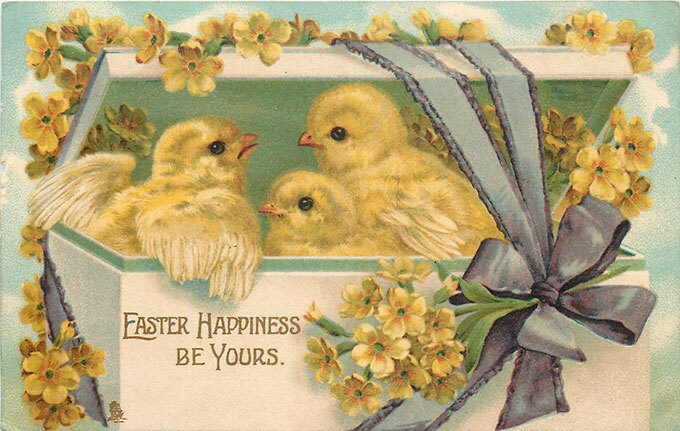 Thank you for the sweet vintage images. Now I have to go get a color cartridge for the printer, thanks, but a good thanks!! 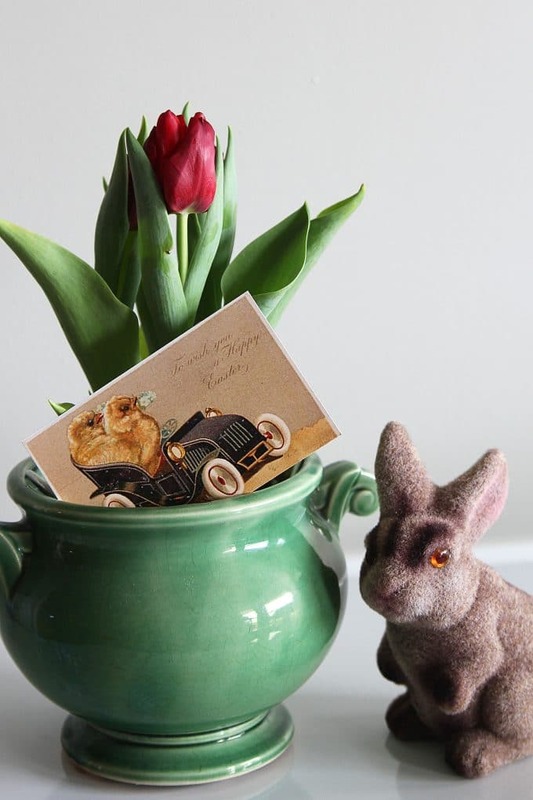 Hoppy Spring!! 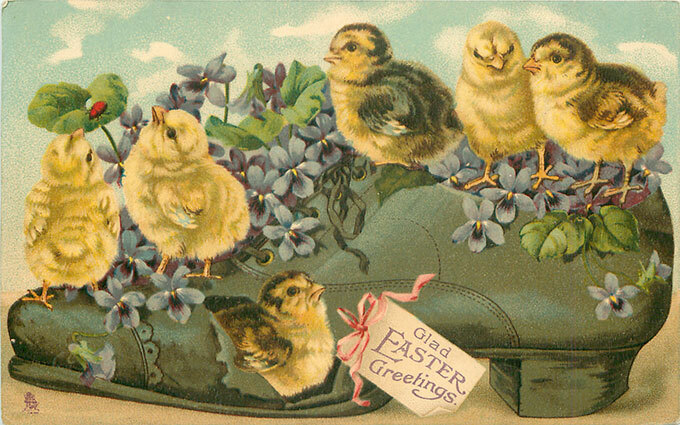 You’ve found so many charming Easter images, Pam! 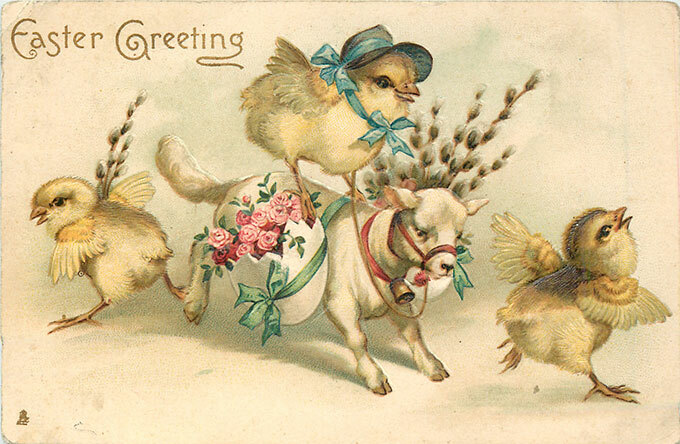 I love the extra-large chicks with the itty bitty cow. 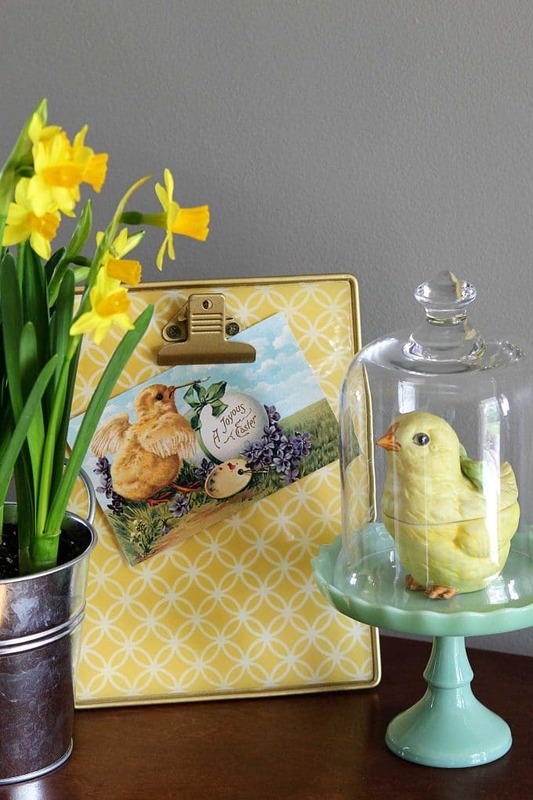 Your yellow clipboard is a nice springy accent to your table display. Thanks for sharing!